A map can make it easier to avoid getting lost in New York City. 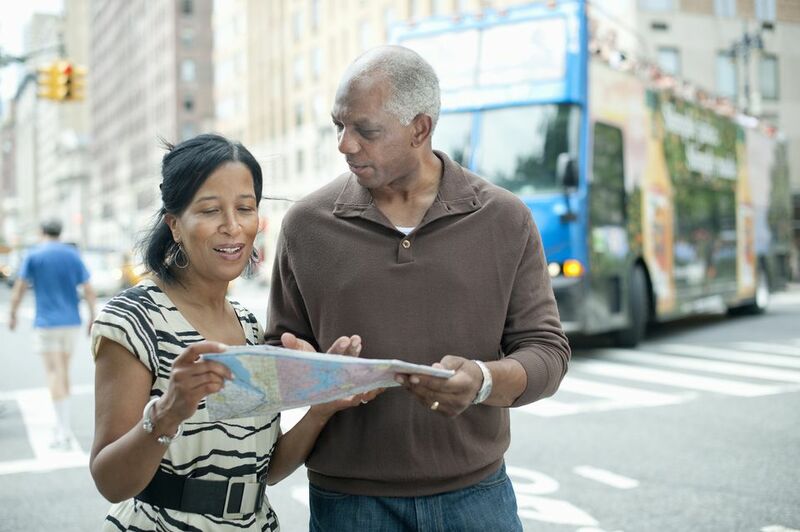 A map of New York City is a valuable tool to use as you plan your trip, but it's also helpful once you arrive. With one of these New York City maps, you'll be able to find your way around easier and plan your days in New York City more effectively. The Streetwise Manhattan map is my top choice for visitors to New York City. It has a sturdy laminated finish, making it easy to fold and resilient enough to survive repeat trips to New York City. We especially like the compact size of this map -- unfolded it is only the size of a piece of legal paper. The index covers neighborhoods, places of interest and museums. Subway lines are included, and there is also a map that covers Manhattan buses. Unless you want to explore Queens or Brooklyn, this map is a good choice. Smaller when folded than most of the other maps, this laminated map is a bit softer than the other maps, making it easy to stick in your back pocket. In addition to the street map, there are separate subway and bus maps, which is helpful when you're trying to plan a route on public transportation. Additionally, the subway map covers the entire subway system (not just Manhattan). The comprehensive index covers 100+ attractions, as well as parks and Central Park landmarks. There is also a list of useful phone numbers for transport, emergencies, and airports on one panel of the map. While not laminated, this map has one advantage over all the others -- it's available for free from the NYC & Company, New York City's official tourism marketing organization. If you chose to request the map in advance online, be sure to allow plenty of time for the map to arrive by mail before you depart. Alternatively, you can pick up a copy of the map at any of New York City's Official Visitor Information Centers. Want your New York City Maps right away? You can print out New York City maps for free with our New York City Neighborhood Maps. Start with the Midtown East map and make your way through the rest.